The BBC reports on a welcome study from the Royal College of Psychiatrists that curcumin, a key spice in curry can help fight against and prevent Alzheimer's. There is lower rate of the disease in Indian cultures and experiements on rats have shown that the protein plaques in the brain associated with the disease were both prevented and removed using doses of the spice. A medical dose is 100 grams which is more than you find in a typical curry, but eaten once and twice a week, together with a balanced diet and regular exercise could be a useful preventative measure. The idea of a Vindaloo pill could be quite appealing. The BBC reports on how Norway´s Statoil are trialling wind turbines that float rather than being fixed to the see floor. The principle looks similar to the oil storage platforms, that have a large column under the water that keeps the mast upright. The whole thing needs to be tethered to the ocean floor, but this is a much easier task than building it up from concrete. The main advantage is that they can be positioned further out to sea, where wind is generally stronger and more consistent as wello as being out of sight from land or posing an obstruction to birds and shipping. It did not take them long, but Google now have a rival for Wolfram Alpha in the lab. Google Squared now collaborates key data from the various results of a single search query into tabular form to compare and contrast results. It looks like it is simply selecting paragraphs that match the query plus some predefined or heuristically obtained key data like locations or categories and presenting them in a table. I am not sure exactly how much intelligence is going on in the background here. To be honest at first glance it looks like only the method of presentation has been changed, using keywords to display data from pages and present it in a table rather than just the links to the pages. I could not see any natural language processing going on here, which Wolfram is supposed to support or any real calculation or summary. However, as I mentioned in a previous post, Google´s approach might be better, because the sources of information are visible, leaving it to the user to ultimately make the choice of accuary and correctness. COBOL is not dead. On the 28 May 2009 COBOL became 50 years old. Part of the reason it is still around is that its main purpose for business related algorithms and form driven input and output has not really needed to change in all those years. A cumulative interest calculation algorithm is still as applicable now as it was then. The Register refers to how Micro Focus, the COBOL compiler experts are celebrating its 50th birthday here. After completing NFS:UC, it was time for something else. I have a slight backlog on games at the moment. I'd restarted Hellgate:London again a couple of months ago after reading the books that were spin-offs from the game and since I'd completed Fallout 3. My second character in Fallout 3 is still going, though I'm still deciding the best direction, since there are parts I still haven't seen. 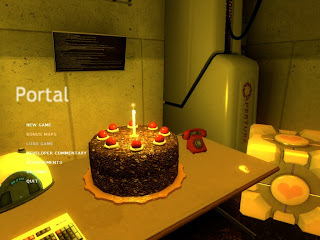 So I installed Portal which has been siting on my shelf for the best of a year, and what a game it is! I knew it wasn't a long game, about 10-15 hours, but the concept was really interesting. As a human test subject in Aperture technologies' nutrition enrichment program, the goal is to get through 19 puzzle filled levels, using a portal gun. This allows you to create transport gateways from one location to another, like walking through a door. You can also attach them to floors and walls so you can fall, which is used to great effect in some of the levels. The fruits of all this labour is the promise of cake at the end of the run...or is it? Anyway, this was great fun. The puzzles were novel and challenging without being overly difficult. The graphics in this 3D world are lovely and the computers voice has some funny things top say and is well worth paying attention to. The comcept of the portal gun was original too. I give this one top marks! Even I have noticed the dwindling numbers of bumblebees in recent years. Most bees that you see are honey bees from managed hives. Einstein made a famous statement about the civilised world being destroyed within ten years should the bee dissappear, due to its important role in pollination. Now a bee that had been originally introduced to New Zealand from the UK is being reintroduced after a twenty year absence according to the BBC. The scheme forms part of a plan to preserve natural habitat to stimulate existing bee populations, which should also benefit flowers and wild animals. Big Ben, the clock tower of the houses of parliament in London is 150 years old today. Actually Big Ben is the cast iron bell but has long been associated with the St. Stephens clock tower, and was first rung on 31 May 1859. This article in the BBC reports provides a summary of how to identify personality traits based on how people hold their drinks when socialising. Body language says everything and is often one of the few cues people have for taking an interest in a prospective mate. I found the blokes descriptions the funniest, and I´ve certainly known a few ¨Jack the Lads¨ and ¨Browbeaters¨ in my time. The BBC reports on the appearance of drug resistant malaria in Cambodia, in which the most effective drug for clearing parasites took almost twice as long to work. Cambodia have apparently a practice of selling cheap drugs that are only partially contain effective elements in order to pass drug tests. This means that drug resistant strains have more chance of developing. Malaria control is also less strict. The worry is that if such a strain should spread uncontrolled from from Asia to Africa that millions would be at risk. Bird brains. There used to be a series years ago where they´d set up a simple mechanism that had to be operated before wild birds could get to nuts or the cream from milk bottles. This article from the BBC reports on rooks, who in the lab are not only able to logically reason that an action has consequence but who seem to go one step further and demonstrate that they are capable of both using and constructing tools in order to get to food, even using two methods in succession to do so. This behaviour is of course common in apes, but rarely in birds. Furthermore this is not seen in the wild, suggesting that the birds may have evolved an innate ability to use tools the past.